President Muhammadu Buhari has met with security chiefs for the third time in one week. Speaking to journalists, the Minister of Defense, Mansur Dan-Ali, said the meeting which last for less than 30 minutes, was only a review of issues discussed with the President during their last meeting on Tuesday. At the last meeting, the president appraised the security situation in the country. 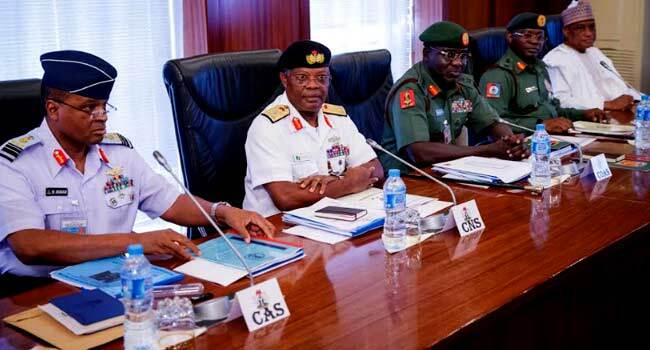 Also on Monday, the President and Vice President Yemi Osinbajo held separate meetings with the security chiefs. File photo: President Buhari in a meeting with security chiefs earlier in the week. The president first met with the security chiefs and heads of security agencies after which the Vice President held a meeting with the Inspector General of Police, Mr Ibrahim Idris; the Director-General of the Department of State Security, Lawal Daura; and the Attorney General of the Federation, Abubakar Malami. Both meetings were held behind closed doors. 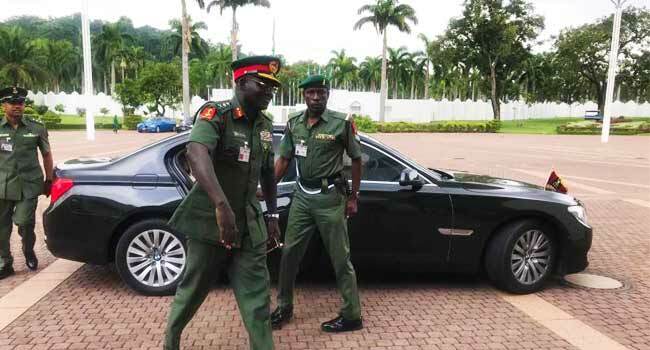 Although the IGP had refused to disclose details of the meeting which lasted for over two hours to journalists, it was believed to be in connection with the ongoing case involving Senate President Bukola Saraki and the police.